Gov. 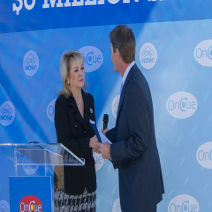 Mary Fallin fills the car with the 3 millionth gallon of compressed natural gas sold by OnCue during the last three years. Gov. Fallin congratulates OnCue Chief Executive Officer Jim Griffith for his company's achievements in the area of compressed natural gas. In the last three years OnCue celebrated the opening of 13 compressed natural gas (CNG) stations across Oklahoma, but last month the Stillwater-based retailer celebrated a milestone of a different kind. milestone has national impact, representing a momentum shift from CNG as a fuel of the future, to a fuel of today. further reinforced the governor’s commitment and leadership to increase demand for natural gas. Governor Fallin’s 22-state, bipartisan effort to increase natural gas vehicle use among state fleets helps ensure CNG customer growth for retailers like OnCue. OnCue was among the first private Oklahoma fueling retailers to adopt CNG. Currently, OnCue has the most CNG stations of any retailer in the state and expects to expand the company’s commitment to CNG in 2013. In the past two years, the number of public CNG stations in Oklahoma has nearly tripled, making it now possible to drive across the entire state solely on CNG. Oklahoma serves as a model for how to develop alternative fueling infrastructure at the state level. For more information on CNG, visit www.cngnow.com.